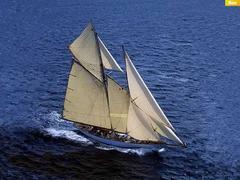 Toby Maclaurin at Ocean Independence tells me that he's listed the 40.8m classic sailing yacht Altair for sale. Altair was built in 1931 by William Fife & Sons and was faithfully restored in 1987 with a major refit in 2007. She has French polished walnut throughout her guest accommodation and the interior of Altair is considered one of the most beautiful and authentic in any yacht. The panelling, door furniture and bathroom fittings are all from 1931. In 2007 all nickel and chrome interior fittings were removed and re-plated with the interior freshly French polished and painted. Sleeping seven guests in a master, VIP and three single cabins, this superyacht is asking €7 million.